The risk of a serious crisis between China and Taiwan is growing. Cross-strait relations have chilled in recent years as a result of the unwillingness of Taiwan’s President Tsai Ing-wen to embrace the so-called 1992 Consensus—an understanding that was the basis for a warmer relationship between Beijing and Taipei under Tsai’s predecessor, Ma Ying-jeou of the Kuomintang (KMT). According to the KMT, the 1992 Consensus holds that both mainland China and Taiwan belong to “one China” but with distinct interpretations. Beijing’s stance, however, is that the 1992 Consensus means there is “one China,” which is the People’s Republic of China (PRC), and that Taiwan is part of the PRC. China responded to Tsai’s refusal to endorse its approach to the 1992 Consensus by implementing a multifaceted pressure campaign to punish and coerce Taiwan into being more compliant. Beijing’s tactics have included suspending official and semiofficial mechanisms for cross-strait communications, reducing the number of mainland tourists allowed to visit Taiwan, pressuring countries that recognize Taiwan to sever diplomatic relations with the island, and conducting military exercises and information operations designed to intimidate Taiwan. This pressure campaign could intensify in the next twelve to eighteen months—particularly in the lead-up to and immediately following Taiwan’s 2020 presidential election—to the extent that it triggers a new cross-strait crisis. Although the United States maintains a “one China” policy in accordance with the three U.S.-China joint communiques and withdrew from its 1954 defense treaty with Taiwan after establishing diplomatic relations with the PRC in 1979, such a crisis would clearly affect U.S. national security interests. Taiwan and the United States maintain an unofficial relationship, but the island is an important U.S. economic and security partner that shares democratic values. The 1979 Taiwan Relations Act holds that U.S. policy is “to consider any effort to determine the future of Taiwan by other than peaceful means, including by boycotts or embargoes, a threat to the peace and security of the Western Pacific area and of grave concern to the United States.” Given its long-standing commitments to the security of Taiwan and its broader economic, diplomatic, and security interests in the Indo-Pacific, the United States would almost certainly become embroiled in a new cross-strait crisis. The United States should be attentive, therefore, to the potential direction of events and take steps to help avert and, if necessary, mitigate a new cross-strait confrontation. Map of China, Taiwan, and surrounding area. Three broad developments are increasing the risk of a cross-strait crisis in the coming months. The first relates to the important role domestic politics play in China and the potential calculations of the leadership. During a January 2019 speech marking the fortiethanniversary of the mainland’s 1979 “Message to Compatriots in Taiwan,” President Xi Jinping stated that unification with Taiwan is “a must for the great rejuvenation of the Chinese nation in the new era.” President Xi has staked his political fortunes and personal legacy on realizing the “Chinese dream” of “national rejuvenation,” especially in the context of the approaching centenaries of the Chinese Communist Party in 2021 and of the People’s Republic in 2049. Xi has not set a deadline for China’s unification with Taiwan, but it is an important part of this policy agenda and it is clearly linked to the realization of these broader strategic goals. This approach could result in a China that is more assertive and willing to tolerate more risks in cross-strait relations. A slowing economy might also tempt Xi to try to resolve the Taiwan question to bolster his legitimacy at home. Additionally, changing perceptions within China of the regional military dynamics and growing confidence in the capabilities of the People’s Liberation Army (PLA), or doubts about U.S. willingness and ability to intervene on behalf of Taiwan, could embolden China to exercise its leverage over Taiwan more aggressively, potentially leading to the most serious crisis in the cross-strait relationship in more than two decades. People in Taiwan increasingly see themselves as Taiwanese rather than Chinese, according to recent polling data. In June 2018, the Election Study Center at National Chengchi University in Taipei found that 55.8 percent of people in Taiwan view themselves as Taiwanese, up from 17.6 percent in 1992, while the number of people identifying as Chinese has declined to 3.5 percent (37.2 percent identify as both Taiwanese and Chinese). There is little support in Taiwan for China’s “one country, two systems” approach, and the heavy-handed implementation of such a system in Hong Kong is making it even more unattractive to people in Taiwan. While the opposition KMT outperformed the ruling Democratic Progressive Party (DPP) in Taiwan’s November 2018 local elections, most observers of the elections attribute this result to the economy and other domestic factors rather than Tsai’s cross-strait policies. In November 2018, following the DPP’s defeat in the local elections, Tsai resigned as chair of the party and was replaced in January 2019 by Cho Jung-tai. Critics have called for a different candidate to serve as the DPP’s standard-bearer for the presidential election in 2020, opening up the possibility for a more pro-independence candidate to run, but Cho is a moderate ally of Tsai, making it less likely that she will face a serious internal challenge. 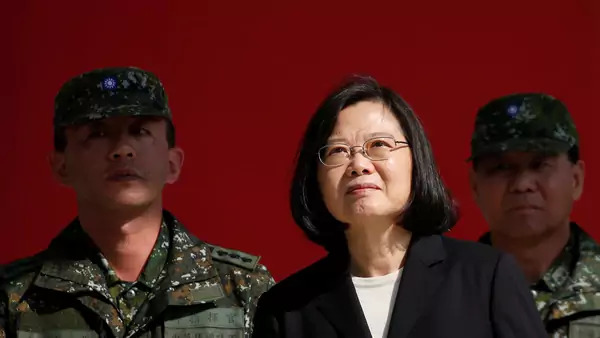 Although Tsai has pursued a relatively cautious course toward the mainland—certainly in contrast to the 2000–2008 policies of Taiwan’s first DPP president, Chen Shui-bian—after Xi’s January 2019 speech, she has publicly used tougher language, which appears to have helped strengthen her political position. She could employ more assertive rhetoric during the 2020 presidential election in response to growing pressure from China. The Trump administration has openly declared China to be a geopolitical rival and a revisionist power. The third development is that U.S. policy toward Taiwan is changing in a way that China perceives as more antagonistic, especially against the backdrop of deteriorating U.S.-China relations. Beijing was alarmed by then President-Elect Donald J. Trump’s phone call with President Tsai. Since then, the U.S. Congress has passed the 2018 Taiwan Travel Act, which encourages high-level U.S. officials to visit Taiwan, much to China’s displeasure. The Trump administration has also openly declared China to be a geopolitical rival and a revisionist power, and has imposed trade tariffs against many Chinese products and sanctions against the Equipment Development Department of China’s Central Military Commission. The U.S. Navy, moreover, has increased the number of freedom of navigation operations in the South China Sea to challenge China’s maritime claims. In addition, the U.S. Navy conducted three Taiwan Strait transits in 2018. Specific events related to one or more of those developments could prompt China to intensify its pressure campaign against Taiwan. This could include, for example, a decision by Xi to press for cross-strait negotiations on an accelerated timetable, Tsai’s replacement ahead of Taiwan’s 2020 election by a candidate more interested in independence, or an attempt by the United States to demonstrate its support for Taiwan that inadvertently prompts Chinese escalation. Whatever the triggering event or sequence of events, China could choose a variety of responses, either separately or in combination. Diplomatic Isolation. China could try to further decrease Taiwan’s diplomatic space by targeting several of Taiwan’s seventeen remaining diplomatic allies simultaneously. For example, China could try to further decrease Taiwan’s diplomatic space by pressuring those countries that still officially recognize Taipei to switch their ties to Beijing. This includes the Vatican and Eswatini, Taiwan’s only remaining diplomatic partners in Europe and Africa respectively, as well as nine states in Latin America and the Caribbean and six in the Pacific. Beijing could also try strong-arming some of Taipei’s unofficial partners into curtailing their level of interaction with Taiwan. Economic Coercion. China could sharply increase economic pressure on Taiwan. For instance, Beijing could stop most or all mainland tourists from visiting the island, reduce the number of mainland students in Taiwan, or harass Taiwanese businesses in China as it did South Korean businesses over the deployment of the Terminal High Altitude Area Defense (THAAD) missile system in 2017. Military Intimidation. China has numerous options to display military power in an attempt to intimidate Taiwan. The PLA could hold major military exercises opposite Taiwan. Such exercises could include a demonstration of amphibious landing capabilities. China could also dramatically increase the level of air force and naval activity around Taiwan, for instance by dispatching its aircraft carrier and conducting flight operations close to Taiwan. China could send fighter aircraft or reconnaissance aircraft across the Taiwan Strait centerline to send a message to Taiwan. In addition, China could increase the number of H-6K bomber flights around Taiwan, which the former sometimes refers to as “encirclement” patrols. 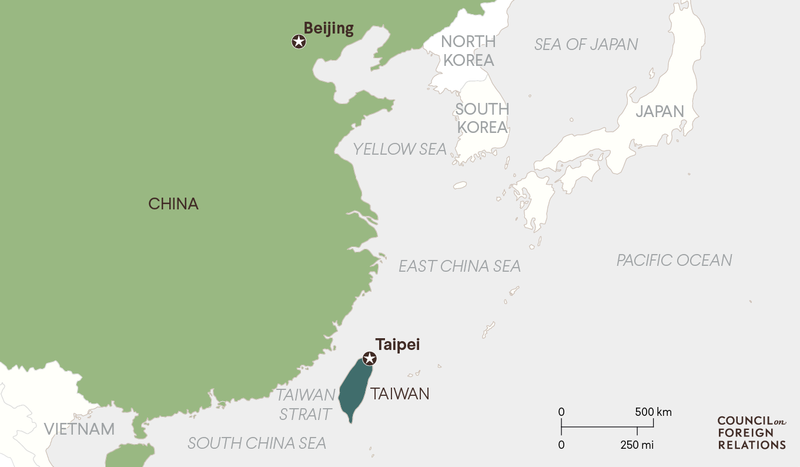 At a higher level of intensity, China could conduct missile flight tests close to Taiwan as it did in the 1995–96 crisis, or even launch a missile over the island. Influence Operations. China could increase its use of official media channels or social media platforms to amplify the message sent by other types of coercive activity. Additionally, China could launch a major information operations campaign against Taiwan, one that could exceed the scale and scope of what it has done in recent years. A stepped-up campaign could include activities such as funding or providing other forms of clandestine support to actors that back Beijing’s agenda, hacking and releasing emails of political actors, and increasing social media manipulation to undermine confidence in the integrity of elections or sow division in Taiwan more generally. Such tactics would conceivably set in motion a series of cross-strait interactions that could escalate tensions to dangerous levels. Much will hinge on how policymakers in the United States, China, and Taiwan perceive and understand one another’s motivations, something that could prove difficult. For instance, it might be hard for Washington and Taipei to tell whether Beijing’s aims are relatively limited (i.e., to coerce Taiwan into again accepting the 1992 Consensus) or if China aims to fundamentally change the cross-strait relationship and push Taiwan in a direction more conducive to realizing Xi’s long-term “national rejuvenation” goals. Decision-makers may be unable to correctly interpret the strategic signals sent by the other parties. Compounding this problem, decision-makers may be unable to correctly interpret the strategic signals sent by the other parties in a growing test of wills. For example, it could be difficult for the United States to ascertain whether a particular movement of military forces by China is intended as a deterrence message or is indicative of an impending escalation of the crisis. China might have similar difficulties interpreting signals sent by the United States. Potentially complicating the situation, the departure of U.S. troops from Syria and possibly from Afghanistan—coupled with the United States’ perceived failure to honor other commitments—could tempt China to increase the pressure on Taiwan, as party leaders may interpret such developments as an indication that the Trump administration would be reluctant to respond as forcefully as his predecessors would have been. As a result, once tensions rise, the relevant parties may be unable to calibrate their responses in ways that would advance their interests while limiting the risk of inadvertent escalation. Various warning indicators are associated with each of the three contributing developments to a cross-strait crisis discussed above. For domestic developments in Taiwan, the most obvious relate to Tsai’s statements, the approval ratings of the DPP ahead of the next elections, changing public opinion (particularly in relation to China), and the emergence of a more pro-independence DPP candidate or a surprise third-party candidate ahead of the 2020 election. The possibility of a DPP candidate Beijing distrusts even more than Tsai, or of a three-way race for the presidency in 2020, could create unpredictable dynamics. The warning indicator associated with Beijing’s desire to ramp up the pressure campaign against Taipei would be sharper rhetoric from Xi, which could indicate impatience with Taiwan or serve as a warning that there could be consequences if Beijing perceives Taipei as politically moving further away from the mainland. Xi could signal an impending increase in pressure by using new language suggesting urgency about Taiwan, such as setting an explicit timetable for unification. Alternatively, he could repeat his previous statement suggesting that the issue of Taiwan should not be passed down “from generation to generation,” or his earlier warning that if the foundation of the cross-strait relationship erodes “the earth will move, and the mountains will shake.” Although a surprise attack by China is extremely unlikely, Xi could also attempt to send a message to Taiwan and the United States by highlighting the PLA’s preparedness for conflict across the Taiwan Strait. For example, Xi could declare the ongoing PLA reforms and reorganization a success. China is undoubtedly aware that some observers suspect the PLA would not be ready for a major conflict in the short term because of the ongoing restructuring, so signaling that the PLA is ready (or that it would be by 2020) could be a seen as a warning. Changes in U.S. policy or a further deterioration of the U.S.-China relationship could also provide warning indicators. If the United States were to take action that suggests it could fundamentally redefine its policy toward Taiwan or abandon its long-standing “one China” policy, China would likely respond strongly. Short of such a dramatic alteration to U.S. policy, if Washington proceeds with actions that Beijing sees as emboldening leaders in Taipei to reject the mainland’s demands or to move further in a direction that China views as antithetical to its interests, the risk of a cross-strait crisis could increase. For example, China strongly objected to the 2018 Taiwan Travel Act, which states that Congress believes it should be U.S. policy to allow U.S. officials at all levels to visit Taiwan. Chinese commentators have also expressed concern about calls for Taiwan to be invited to participate in the Rim of the Pacific (RIMPAC) military exercise and for U.S. Navy vessels to make port calls in Taiwan. A high-profile arms sale to Taiwan that included cutting-edge hardware such as F-35 fighters or submarines could also raise tensions with China. Additionally, a sharp downturn in the U.S.-China relationship over other issues, such as trade or the South China Sea, could make a cross-strait crisis more likely by hardening Chinese perceptions that the United States is intent on containing China and wishes to play the Taiwan card to check China’s rise more broadly. If China decides, for whatever reason, to ramp up pressure on Taiwan, there would likely be additional signals including leadership statements that criticize specific actions by Taiwan or the United States, harsh condemnations of pro-independence politicians in Taiwan in various media outlets, and other moves to prepare the public for a confrontation. In addition, some tactical indicators might be observable shortly before China increases the pressure on Taiwan. These signs could include unusual activity by Chinese military units, intensified intelligence operations against Taiwan, or heightened levels of Chinese computer espionage against political parties or election-related targets in Taiwan. A cross-strait crisis in the run-up to Taiwan’s 2020 elections or shortly after would present serious risks to U.S. interests. At a minimum, a cross-strait crisis could result in a broader freeze in U.S.-China relations, which could complicate other important issues—regionally and globally—in the relationship. For example, it could exacerbate tensions in other areas where there is already considerable friction (e.g., maritime disputes in the South China Sea) or imperil cooperation on other issues of concern (e.g., North Korean denuclearization), at least temporarily. A successful pressure campaign could embolden China to apply similar tactics elsewhere. For example, if the Chinese government successfully intensified its interference in Taiwan’s elections (e.g., manipulating social media, covert financing of preferred candidates, or hacking and releasing emails or other data), it could try to apply the same or similar tactics elsewhere. The consequences for U.S.-China relations could be severe. A crisis could also fundamentally damage U.S.-China relations and the overall U.S. posture in the Indo-Pacific. This scenario could play out differently depending on how the United States reacts and how its reaction is perceived by other actors in the region. Particularly if the U.S.-China relationship continues to be characterized by friction over trade and security issues, a concerted U.S. effort to push back on Chinese pressure could convince Beijing that Washington views Taipei as a useful part of a containment strategy. On the one hand, the consequences for U.S.-China relations could be severe, potentially solidifying a more adversarial relationship overall, but U.S. allies and partners might be reassured by a demonstration of Washington’s willingness and ability to stand up to Beijing. On the other hand, if the United States fails to help Taiwan respond to escalating Chinese pressure tactics or if the United States responds but is unable to stop China, other U.S. allies and partners in the Indo-Pacific—in particular Japan and South Korea—might see the United States as lacking in resolve or in capability. This scenario could increase their concerns about Washington’s reliability and predictability, and cast doubt on the credibility of U.S. commitments in the region and beyond—all of which would undermine Washington’s ability to implement national security and national defense strategies that rely on cooperation with allies and partners. Finally, although the risk of a crisis escalating to war is low—as that outcome is presumed not to be in any actor’s interest—it exists. Misunderstandings and miscalculation could still propel the parties to outright conflict. Encourage Beijing and Taipei to avoid a breakdown in cross-strait relations. Washington could encourage Beijing and Taipei to improve their channels of communication in hopes of avoiding a breakdown in cross-strait ties. The United States could also caution both sides to avoid unilateral actions that could further deteriorate the situation, as President George W. Bush did in 2003 over concerns about then President Chen’s referendum plans. The situation has since changed, and the current threat to stability comes primarily from the mainland. Tsai has been largely pragmatic since assuming office, but Beijing appears to distrust her and has increased the pressure on Taipei because it is unwilling to accept an outcome short of an endorsement of the 1992 Consensus and its core connotation of “one China.” A more ambitious version of such an approach could also include encouraging the mainland and Taiwan to search for creative ways to break the current impasse, such as finding an alternative to the 1992 Consensus that is acceptable to leaders on both sides. However, the chances of success are slim. Moreover, given the recent deterioration in the U.S.-China relationship, Beijing would likely reject any such U.S. involvement as interference aimed at undermining China’s interests. In addition, many people in Taiwan might object to such a U.S. initiative, seeing it as pressure to accommodate China and thus a potential violation of long-standing U.S. assurances. Strengthen the U.S.-Taiwan relationship and enhance Taiwan’s resilience. The United States could enhance its support for Taiwan within the framework of its long-standing policy approach, helping improve Taiwan’s resilience and strengthen its deterrence posture vis-à-vis China. This support could include new arms sales, and perhaps further normalization of the arms sales process, but it need not be limited to military hardware. It could also include increasing assistance in other areas, such as strengthening Taiwan’s reserve forces and helping Taiwan develop a more innovative defense strategy. Washington might also consider being more transparent about some aspects of U.S.-Taiwan security cooperation in order to more clearly signal its support for Taipei. Furthermore, while some may consider it hypocritical, Washington could also encourage Taipei’s remaining diplomatic partners to resist pressure from the mainland to switch recognition to Beijing and step up its efforts to help Taiwan expand its international participation more generally. The United States could also facilitate Taiwan’s efforts to diversify its economic relationships, such as by moving ahead with a U.S.-Taiwan trade agreement or by helping Taiwan join the Comprehensive and Progressive Agreement for Trans-Pacific Partnership (CPTPP). Additionally, the United States could help Taiwan improve its capacity to uncover and respond to China’s cyber intrusions and political influence operations. Strengthen U.S. capabilities for deterrence and the defense of Taiwan. The United States could continue to develop advanced military capabilities and new operational concepts intended to prevent China from using force to compel unification. In addition, the United States could strengthen its deterrence of China by revealing enough about the development of these capabilities and concepts to demonstrate that it can respond effectively to any Chinese attempt to achieve unification by force. China’s growing power means the United States will be unable to dominate China militarily, but it can still improve its ability to deter Chinese use of force and to defend Taiwan if deterrence fails. Seek to defuse the crisis diplomatically. Washington could attempt to facilitate communication between Beijing and Taipei and encourage leaders on both sides of the Taiwan Strait to de-escalate the situation and seek a cooperative, mutually acceptable way to end the crisis. Such an approach has several downsides. China might misread U.S. attempts to facilitate a cooperative resolution as reflecting weakness, particularly if they are not accompanied by signals of U.S. support for Taiwan and appropriate deterrence messages. In addition, the United States would need to be careful to avoid creating the perception that it is willing to ignore the wishes of the people of Taiwan, pressure Taiwan to accede to Chinese demands, or use Taiwan as a bargaining chip. Rather than pursue any breakthroughs, the United States could simply try to avoid any major breakdowns. To this end, the United States could signal its opposition to unilateral statements or actions by either China or Taiwan that would threaten further escalation of the situation, while avoiding any such statements or actions itself. Demonstrate U.S. economic, military, and political support for Taiwan. The United States could make clear that it supports Taiwan and intends to help the island withstand Chinese pressure. This option would need to be tailored to respond to China’s approach. For example, if Chinese pressure against Taiwan involves information warfare or influence operations, the United States could provide technical expertise or other forms of assistance to help Taiwan assess and counter China’s activities. Washington could also consider enlisting the assistance of other allies to show their support for Taipei. Even as it seeks to demonstrate its support for Taiwan, the United States would need to carefully avoid taking actions that might inadvertently escalate the crisis, such as deploying U.S. forces to Taiwan. Take steps to persuade China to back down. The United States could pressure China to back down or at least attempt to deter China from further escalating the crisis. This could include deploying additional military forces to the Indo-Pacific region to deter China. Washington could encourage some of its allies and partners to participate in these deterrence operations. The United States could also focus on influencing China’s decision-making calculus by highlighting the risk that Beijing would be unable to control the pace of escalation or ensure a quick resolution of any conflict on acceptable terms, both through private channels and in public statements. At the same time, however, successfully persuading China to back down would almost certainly require some corresponding assurances that exercising restraint would not leave it in an unacceptable position. This option could be a challenge, however, as Beijing might not find the assurances credible, or Taipei might view them as potentially undermining its interests. The situation across the Taiwan Strait is changing for several reasons, and the danger of a crisis appears to be growing as Taiwan’s 2020 elections approach. Washington should aim to strengthen deterrence while working within the context of a long-standing policy that helps maintain stability and affords considerable flexibility. The United States should encourage China and Taiwan to maintain a stable and constructive cross-strait relationship. Within this context, the United States is unlikely to facilitate a major breakthrough in cross-strait relations, though it should do what it can to prevent them from worsening. Because this is a sensitive time in cross-strait relations, careful diplomacy and stewardship are required to reduce the risk of crisis. In particular, the United States should encourage China and Taiwan to maintain a stable and constructive cross-strait relationship on terms consistent with the interests and aspirations of the people of Taiwan, primarily by reiterating clearly and publicly its opposition to unilateral actions altering the status quo. Unlike a decade ago, however, the U.S. response will need to take into account that unilateral action by the mainland appears to be a much greater threat than Taiwan’s crossing a line that triggers a Chinese response. The United States should also develop a multidimensional approach to enhancing its relationship with Taiwan and strengthening Taiwan’s resilience and ability to deter Chinese coercion, as detailed below. Because escalating Chinese pressure presents a multifaceted threat to Taiwan, the United States should think more broadly about how to help Taiwan strengthen deterrence and increase its resilience. Since Beijing would likely rely on a strategy that incorporates a variety of diplomatic, economic, military, and informational instruments of power, Washington should develop an approach that accounts for the challenges presented by all of the different elements of a Chinese coercion campaign against Taiwan. The overall goals should be to help Taiwan mitigate its vulnerabilities and to convince China that it would be unable to use its leverage against Taiwan in any of these areas without taking large risks. To counter Chinese diplomatic isolation, the United States should continue to support Taiwan’s participation in international organizations such as the International Civil Aviation Organization, Interpol, and the World Health Organization, and expand successful initiatives such as the Global Cooperation and Training Framework. The United States should also do more to facilitate Taiwan’s efforts to deepen strategic dialogues and exchanges with other democracies, including Australia and Japan. To bolster Taiwan’s deterrence posture, the United States should continue arms sales to Taiwan and assist Taiwan in its attempts to strengthen its domestic defense industry. The United States should also enhance support for Taiwan’s efforts to develop and implement a new defense strategy, strengthen its reserve forces, and reform its military service system. In return, the United States should expect Taiwan to increase its defense spending and focus on implementation of its new Overall Defense Concept, which emphasizes asymmetric responses to China’s growing military power, including more mobile and survivable systems. The United States should also aid Taiwan’s efforts to diversify its economic relationships and reduce its economic dependence on China. This assistance could include supporting President Tsai’s New Southbound Policy, which is intended to enhance Taiwan’s economic ties with the Association of Southeast Asian Nations (ASEAN), Australia, New Zealand, and South Asian states. In addition, it could include pursuing a U.S.-Taiwan trade agreement or supporting Taiwan’s desire to participate in CPTPP. The United States should explore additional ways to help Taiwan. The United States should explore additional ways to help Taiwan increase its ability to uncover and counter Chinese information warfare and political influence operations. Some of this help might need to be provided behind the scenes for it to be effective, but when possible the United States should consider publicizing what it knows about Chinese operations and publicly highlighting its willingness and ability to work with Taiwan to diminish their damage. The United States should also encourage other countries that have experience in countering Chinese or Russian influence operations, such as Australia and France, to coordinate and work with Taiwan to help build its capacity to respond to such activities. The United States should further strengthen its own deterrence and defense capabilities and emphasize a deterrence-by-denial approach against China. This approach would likely be more credible than a deterrence approach that is premised on the threat of punishment and would also ensure that the United States is prepared to defend Taiwan if deterrence fails. Moreover, Washington should clearly communicate to Beijing that it is updating its own operational concepts and military capabilities in response to improvements in Chinese military power. Specifically, the United States should display new capabilities and conduct exercises in ways that are designed to show China that the United States will be able to counter Chinese use of force against Taiwan, if necessary. In addition, Washington should try to induce caution on Beijing’s part by signaling that China would be unable to ensure a fast and decisive resolution on its terms, or to control escalation with the level of confidence some Chinese strategists have suggested would be the case in the event of a regional conflict. The danger of a new cross-strait crisis is increasing as a result of developments in the United States, China, and Taiwan. A Taiwan Strait crisis could begin in several ways, and any such crisis would present serious challenges to U.S. interests. The risks would be heightened by the fact that Beijing has a wider and more powerful variety of options to coerce Taipei than it did during the last major showdown in 1995–96. Rather than waiting for the situation to deteriorate before taking action, U.S. policymakers should consider and prepare to implement options to avert a cross-strait crisis, as well as to be better positioned to deal with one effectively if it cannot be avoided.